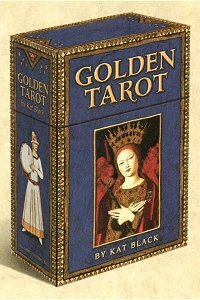 As mentioned in my introduction and also in the Little Blue Book that accompanies the deck, Golden Tarot was born on the web. The original version was made as low (screen) resolution over a few months on my VAIO laptop as I travelled around the US and UK in 2000. That was more of a hobby than anything, and never intended to be published. A long and bizarre series of events followed, involving piracy of the deck and then finally a campaign by my online fans that resulted in a publication deal (see site for more info about those events). I then rebuilt the deck at high resolution, making it far more detailed and similar to the standard Rider Waite deck. This process took me 1500 hours of pixel-pushing using PaintShop Pro to create multi-layered digitally collaged compositions for each card. My intention was to make a deck that looked genuinely Medieval/Renaissance, but that was as easy to read with as a modern Rider-Waite type deck. The Art Sources - where are they from? Is Golden Tarot Rider-Waite clone? Other online purchasing options can be compared on my Shop page, as well as other recommended books, decks etc.